Already we’ve seen over eight hundred entries in the Hackaday Prize, and there are still months to go. We’re already through the Open Hardware Design Challenge, and twenty fantastic projects from that are moving onto the final round. Yesterday, we announced the winners of the Robotics Module challenge, and again we were blown away. These are the greatest bits of hardware anywhere, and we couldn’t have imagined anything more awesome. 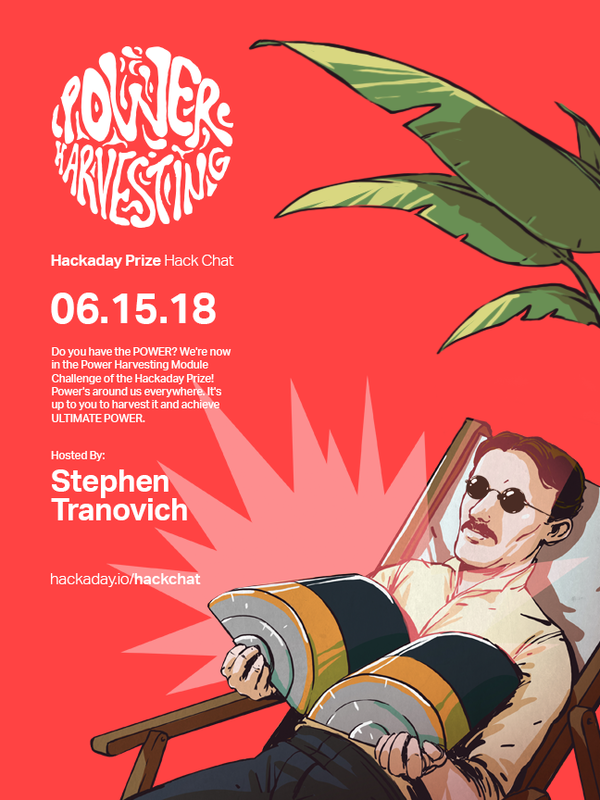 For this week’s Hack Chat, we’re going to be talking all about The Hackaday Prize. This is your chance to be a hardware hero and finally get some recognition for what you’ve been working on. Right now, we’re in the Power Harvesting Challenge in this year’s Hackaday Prize, and we want to see what you can come up with that will get energy from solar, thermal, wind, or random electromagnetic energy. This is your time to shine, and we can’t wait to see what you come up with. Of course, you might have a few questions on what it takes to make a successful Hackaday Prize entry. For this week’s Hack Chat, we’re going to sit down with [Stephen Tranovich], the person coordinating this year’s Prize, to see what makes a successful entry. This is your chance to find out what it takes to become the next great hardware hacker, and it’s all going down this Friday in the Hack Chat. How can you get publicity for your project? Want to bounce your project ideas off the community? What’s the story behind the seed funding confusion from this year? Our Hack Chats are live community events on the Hackaday.io Hack Chat group messaging. This week is just like any other, and we’ll be gathering ’round our video terminals at noon, Pacific, on Friday, June 15th. Here’s a clock counting down the time until the Hack Chat starts.